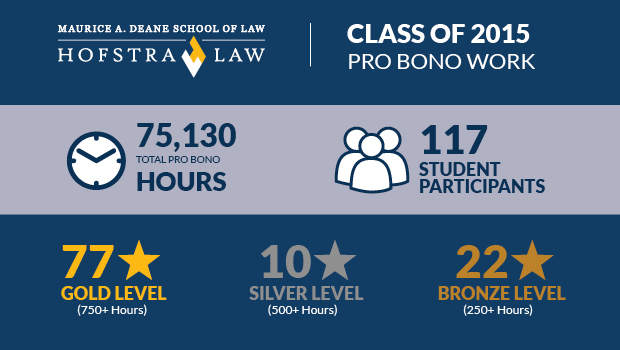 The members of the recently graduated Class of 2015 demonstrated a deep commitment to pro bono work during their three years at Hofstra Law, collectively contributing 75,130 hours of service. Of the 280 graduates, 42 percent engaged in pro bono work, and nearly all of these 117 students qualified for a Public Service Award, with 22 students serving over 250 hours (bronze award), 10 students over 500 hours (silver) and 77 students over 750 hours (gold). 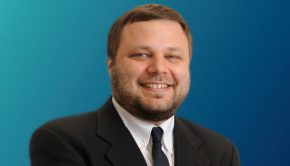 The five students who contributed the most pro bono hours were Julia Elmaleh Sachs, 1,806 hours; Ben Gerson, 1,799 hours; Damore Ramwa, 1,677 hours; Carolyn Kim, 1,451 hours; and Allison Flood, 1,378 hours.